← 1892 Shock News : Glacial Collapse In Alaska! I was looking at a news story last week, and a reader comment mentioned that this blog was a good source of information about data tampering at NASA and NOAA. Someone else responded with a comment that Steven Goddard is a birther and this site must be avoided. I reported that Obama’s close associate and biography literary agent, listed him as being born in Kenya for 17 years, from 1991 to 2007. This should raise giant red flags in any rational person’s mind, but the only thing the left understands is protecting their position. These people are The Borg. No independent or disruptive thoughts are permitted. Obama was either lying about his birthplace in 1991, or he is lying about it now. Either way he is an unpatriotic liar. Is anyone actually stupid enough to believe that his agent could have accidentally made this mistake, and that he could have accidentally overlooked a huge error like this in his bio – for one third of his life? 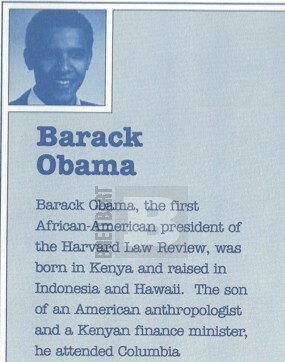 Barack Obama is the original birther. He is the one who started the story that he was born in Kenya. His literary agent changed the story after 17 years, right after he announced he was running for President. In the meantime, Obama’s figment son, you know the one that would be like Trayvon if he had one? Well now he’s not going to let his figment son play football ! Poor kid. That poster is one of the reasons I avoid the MidAtlantic forum over there. I’d swear the poor girl has mental problems; (that is assuming she is sober when she posts). The Austian in Germany, the Georgian in Russia and now the Kenyan in America. Apparently when others propagate someone else’s mistake, it becomes truer. Just like CAGW, I guess. Obama’s birth certificate was quickly exposed as a forgery. So what is Obama trying to hide? Perhaps the fact that his real father was Frank Marshall Davis, a card-carrying member of the Communist Party USA (CPUSA) and Soviet apologist who served as Obama’s childhood mentor and confidant. Obama’s ideas for re-making America certainly aren’t original. Here is one of Bill Whittle’s “Firewall” videos (12 minutes long). It is an excellent synopsis of Obama’s upbringing, and how it was steeped in communism. I don’t know why Whittle never made part 2, which was supposed to focus on Obama’s college years. Doesn’t matter if he was born in the lap of the Lincoln Monument. His mind-set is as as un-American as it possibly could be. Totally unsuited to guide America. He’s an opportunist who is Kenyan when it helps him and American when it helps him. We really know nothing about him, which is down right scary. 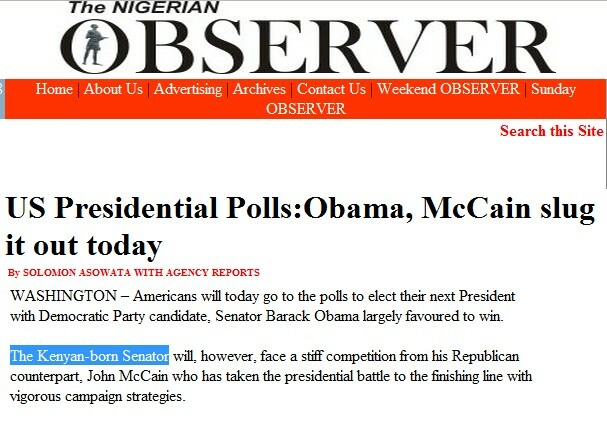 As sensitive as the left is to anything even resembling racism, is it possible that his biographer would have called a US senator a Kenyan, just because he is black? There can be no question that they agreed on this part of his bio.